Once you achieve the shower of your dreams, you’ll hardly think about the surface and waterproofing system beneath it. However, to make your shower last, spend some time preparing its substrate before installation begins. In shower installations, all products work as a system. Confirm that your drain, waterproofing system and setting materials are all compatible. Before you begin, make sure you have a clear, safe installation area. Remove all shower and bath fixtures. Cover all surfaces that you will not be tiling to protect them from installation debris. Before undertaking waterproofing a shower, confirm that your shower substrate is compatible with both your waterproofing system and your tile. 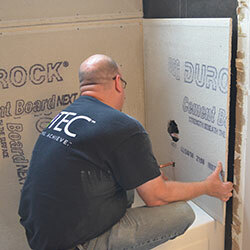 Approved substrates for shower walls and tub surrounds with a showerhead include cement backer board, fiber cement back board, mortar bed, glass mat water-resistant gypsum backboard, cementitious-coated extruded foam backboard walls, fiber-reinforced water-resistant gypsum backer board, concrete or masonry. For a tub surround with no showerhead, you can also work with water-resistant gypsum board. Regardless of what type it is, your shower substrate must be structurally sound and well-braced, with a maximum stud spacing of 16” on center. Make sure the substrate is securely attached to the wall studs. Any section of drywall or other surface that has been damaged by moisture must be replaced. If installing new backer board, be sure to follow the manufacturer’s instructions. 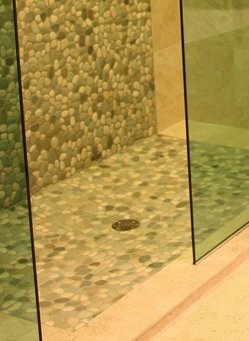 The shower substrate must be flat and even, without holes or voids. The maximum variation is ¼ inch over a 10’ span. If a concrete or approved wood substrate is not quite level, replacement is not necessary. Fill any holes, cracks, voids and depressions with TEC® Skill Set Fast Setting Patch. Keep your installation timeline on track with this fast-setting product – it sets within 40 to 45 minutes. If you are tiling over existing tile, be sure that all tiles are secured. 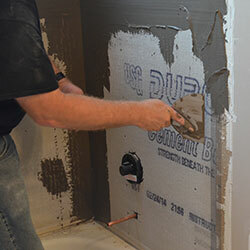 A waterproofing membrane is recommended for shower walls. If you opt out of waterproofing, mold and mildew might grow as moisture from your shower enters the wall. You have a variety of options for waterproofing – including sheet, roll-on and trowel-on products. For a quick and easy waterproofing option, check out TEC® Skill Set™ Waterproofing and Crack Prevention Membrane. Certain areas – inside corners, outside corners, anywhere vertical surfaces meet horizontal surfaces or anywhere dissimilar materials meet – of your shower will be more susceptible to water penetration than others. You will want to flash these areas with TEC® Waterproofing Mesh. To do so, first pre-coat the areas 4” on each side. Then, fully embed the 6” wide waterproofing mesh in both directions into the pre-coated areas with a 3” overlap on each side. Allow the flashed areas to dry for approximately 30-45 minutes before full application of the membrane. To waterproof your entire shower, TEC® Skill Set™ Waterproofing and Crack Prevention Membrane should be applied in two coats, 25 mm. thick, over the entire surface. Use a 1/4”-1/2” nap roller or 3/16” x 5/32” V-notch trowel to apply a continuous, even film with overlapping strokes. Make sure there are no voids, bubbles or breaks in the membrane after it cures. Let the first coat dry for an hour before applying a second coat. Trowel or roll this coat on at a right angle to the first one in order to fill any imperfections. If you use a trowel, smooth out the membrane ridges with a flat side of the trowel immediately after the application. Clean tools, hands and excess material immediately. Material that is cured is difficult or impossible to remove – which is good news for your shower, but not for your tools! 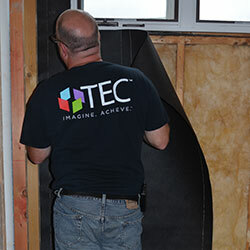 Typically, the membrane is ready for tile installation in just 3 to 4 hours, and you can install tile directly to the membrane using any TEC® Skill Set latex-modified mortar. Preparing the shower substrate for your shower floor can be quite complicated – and shower floor mortar beds must be properly waterproofed and installed to avoid potential problems. With that in mind, have a professional install a shower pan appropriate for the space. Using a professional for this one step of your installation will save you hours of aggravation, and help ensure that the tile that you install in your shower will last. Make sure that your shower drain works with the tile design you’ve selected. If you’re using larger tile, you’ll probably need to use a linear drain. Consult with the Ceramic Tile Institute of America for additional product recommendations. After waterproofing the shower and preparing shower substrate, the next step to a shower tile installation is to lay the tile. I'm installing a 3' x 6' cultured marble base on a plywood subfloor. The floor is about 3/4 " higher on one end and I want to use the TEC leveling product. Do I need to use a diamond lath over the floor? Also, should I use a silicone caulking compound to seal the seams of the plywood and the spaces around the perimeter of the shower base area where the 2" x 4" framing meets the subfloor. Hi Rob! Good questions. We'd like to ask you a few simple questions about your installation to make sure that we're recommending the right products. Please give our Technical Support Team a call at 1-800-832-9023, so that we can best help you through this install! Hi Joe, first you should remove the tile, clean the substrate and remove any loose mortar. Confirm that the substrate is in good condition. Then, use a latex modified mortar, such as TEC Skill Set Porcelain Mortar, to bond the tile to the substrate. Once the mortar has cured, you can begin grouting the joints between the tile. Then, once grout has dried, caulk the joints between the tile and drain. Feel free to call my technical support team at 1-800-832-9023, and we can walk you through the installation. We're more than happy to help. Good luck! Hi Ron would you please describe your process of protecting the waterproofing project ,yourself and other workers during the waterproofing application and curing processes. The TEC Skill Set Waterproofing and Crack Prevention Membrane is thicker than typical paint however it is applied in the same manner, with a paint roller or by brush. As such, protection of the project and those around it during application would be similar to a painting project. As it dries, the membrane should be protected from gouging or damage that disturbs the integrity of the membrane.